Scotland Yard has brought you an intriguing case. Eccentric Lord Byron had a feeling his days were numbered, and now he has been found dead under suspicious circumstances. A will that benefits a distant cousin has been found, but his nephew claims it was forged. In his home, Lord Byron has left clues on where to find the original will and how to identify his killer. The judge will execute the forged will in one hour unless you can locate the original. Help the nephew by finding the original will before the greedy cousin claims the estate! After the stunning one two punch of Alice in Wonderland and Innocent!, we were raring to take on another room at River City Escape. After debriefing from Innocent! and having a quick chat about the room, we huddled into the briefing room again to get started! 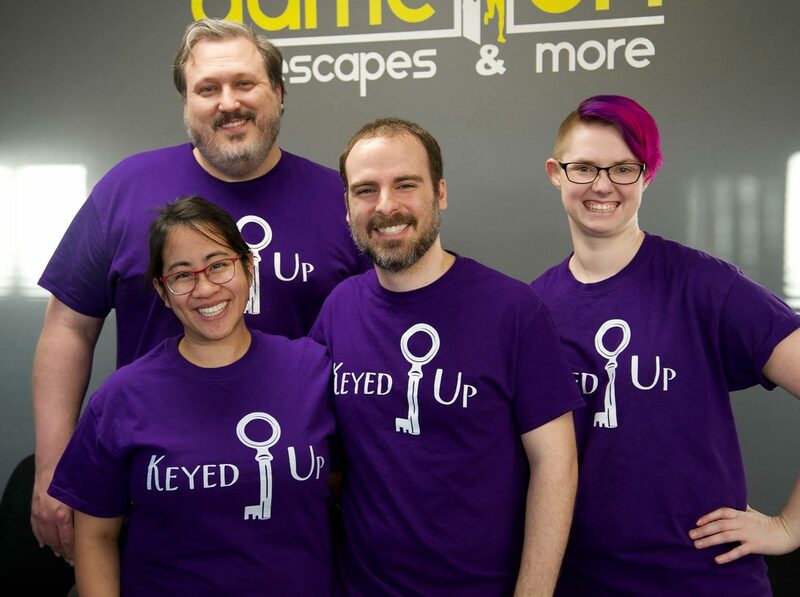 For this last River City Escape Room review, (for now, we’re definitely returning,) I would be remiss not to mention the fantastic game mastering done by Rachel and Dennis, our favorite GMs of all time! Thanks again guys for an astoundingly good experience. The room was well decorated, with a roomy set filled with puzzles to engage with, giving off the vibe of a cozy British study. The adventure starts in a non-linear fashion, and there is plenty to work on throughout to keep a larger group occupied. The room does encapsulate the spirit of Sherlock by presenting a game in which all the little details matter, and some of the biggest clues can be found in plain sight, as long as detectives know what they’re looking for! Many times, we would find items around the room that seemed innocent enough, but once we’d solved a puzzle, we’d find that our next step involved these newly identified clues. The mystery was very intuitive due to this, and we always felt like we were right on track, even if the solution was still evading us. The game flow benefits greatly from the intuitive cluing included within Sherlock. The connective tissue of the game is well woven, and presents many ah ha moments throughout. Most stages of the game included a moment of revelation where everything came together, and the entire experience was an excellent run of satisfying solves. I actually have a difficult time determining what my favorite puzzle was, as the puzzles were constantly keeping me on that puzzler’s high while still presenting a fair challenge to us all. The quality of River City Escape Room is really evident from start to finish, and by the time we were done, we were already ready to return. The introduction video for Sherlock is a bit silly. The theme it describes and the tone/word choices present the theme less like a Sherlock room, and more like a down home, country murder. This isn’t really a bad thing, it actually sounds like a super creative theme, it just doesn’t jive with the current stated ambiance of the room. It certainly didn’t dull our enthusiasm for the room, but it was fairly dissonant. Overall, the Sherlock theme wasn’t all that present, seeming more to be a light dusting of Sherlockian tropes to get the mystery started, and wasn’t really the main focus of the story. Black light usage was pretty heavy for part of this room, but all of it was properly directed, so this wasn’t a huge problem. After sleuthing our way through Sherlock, it’s apparent that in terms of great customer service, engaging puzzles, and exciting escapes, River City Escape Room is tough to beat! I absolutely recommend trying out Sherlock, or any other room they offer, as their experiences are a delight. Book your time solving Lord Byron’s murder here! Full Disclosure: River City Escape Room provided comped tickets for this room.